A reminder to everybody that NZ Speculative Fiction Blogging Week is now on and finishes on 25 September. 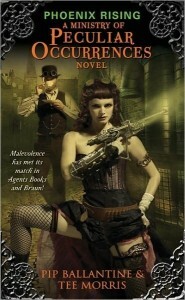 To celebrate blogging week, Helen Lowe has interviewed New Zealander Pip Ballantine and her co-author, Tee Morris, about Phoenix Rising, their recently published first novel in the Ministry of Peculiar Occurrences series, set in an Avengers meets X-Files “steampunk” world of Victoriana, difference engines–and yes, tea! To enjoy the interview, click here. As an added incentive, the interview contains news of a giveaway prize.